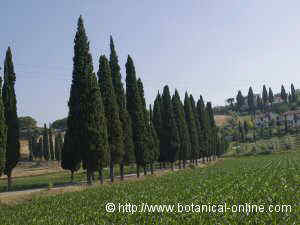 Traditionally, cypress, a symbol of death, has also been quite used for its medicinal properties. Rich in essential oils: alphapinene, betapinene, camphene, sabinol, silvestrene, cymene, camphene, cedrol and cardinene. 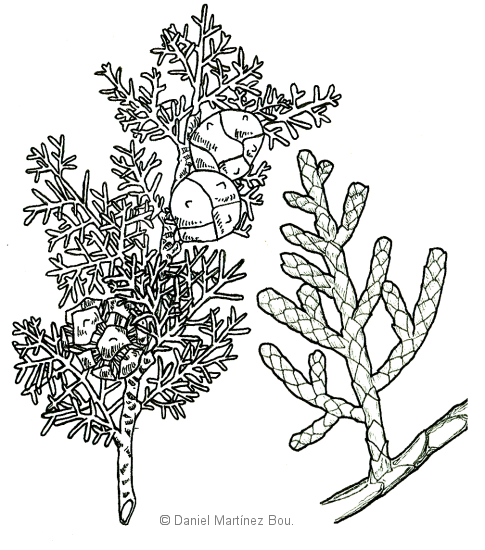 Drawing of detail of cypress leaves and fruits. 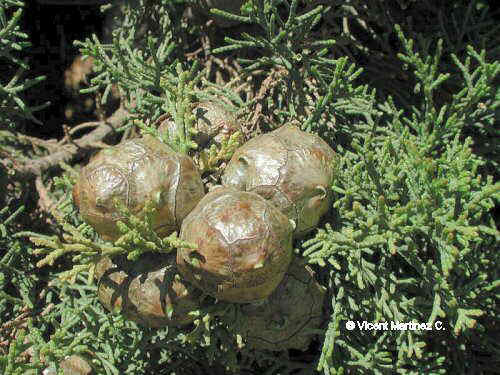 One of the main medicinal properties of the cypress is its ability to treat diseases of the circulatory system with bleeding problems or inflammations of the veins. This type of abnormality is a frequent cause of pain in the lower extremities. Varices: The protection and antiinflammation protection of the veins may be used in the treatment of varicose veins in the legs helping sick people to reduce pain and swelling. Also its ability to stop bleeding varices can be used when presenting with wounds. 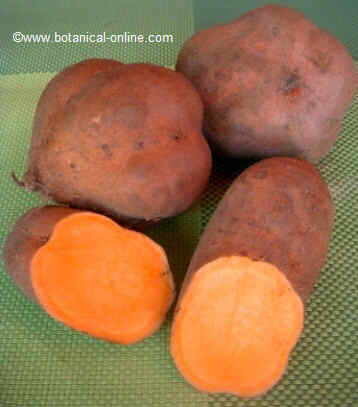 Its richness in tannins help disinfect and cure this type of leg ulcers. (Decoction for about 10 minutes of two tablespoons of dried leaves per liter of water. Strain and let it cool. Take seven tablespoons daily) (For external use, a gauze with the liquid from the decoction applied on the affected area, including on ulcers or sores). 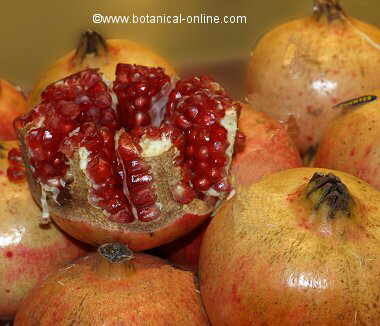 Tannins have a role in accelerating wound healing and hemostasis, that,s to say stop bleeding. Healing occurs by the formation of crusts by binding proteins with the tannins and create a “dry” means that prevents bacterial growth. From the leaves and twigs of cypress, and its fruits, you get the essential oil, a liquid of pale, yellow or olive green color and strong smoky odor. Cold: It helps to fight colds, reduces the symptoms of this disease, reducing inflammation, diminishing cough, helping to eliminate excess mucus, soothing the throat, etc. Excessive sweating: To combat excessive sweating, especially affecting the feet, foot baths can be made with the liquid from the decoction for ten minutes of three tablespoons of crushed twigs per liter of water. This treatment can also serve to remedy smelly feet. Acne: The astringent properties of this tree can be used for external treatment of acne. Wet compresses soaked with the fluid from the anterior decoction can help eliminate many symptoms of the acne like pimples, pustules, oily skin, blackheads, etc. 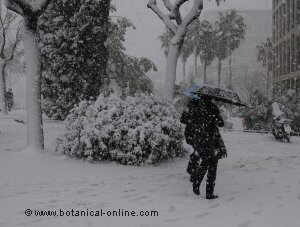 Chilblains: The astringent properties of this tree can be used for the treatment of chilblains. Perform foot baths with the liquid from the decoction for ten minutes of three tablespoons of crushed twigs per liter of water. 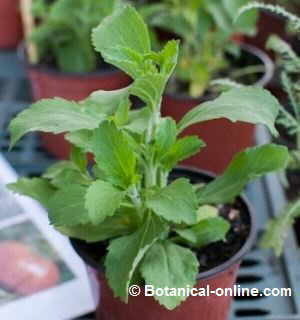 Seborrhea: Its use on the scalp will remove excess of fat and give more strength to your hair. Make capillary frictions with the liquid resulting from the decoction for ten minutes of three tablespoons of crushed twigs per liter of water. 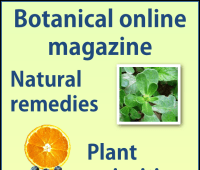 Cypress essential oil is widely used in cosmetic industry for its many properties. It is a good antiseptic and a great vulnerary for the skin that appears in the composition of colognes, perfumes and shaving lotions. 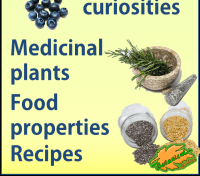 The pharmaceutical industry uses the essential oil of cypress in the composition of many medicines. No side effects have been reported at therapeutic doses. 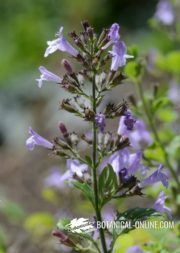 Although the essential oils is not very irritating when applied to the skin, allergic reactions have been reported in individuals sensitive to this product. When used internally, it should be administered with caution because, in excessive doses, it can be toxic. The product administration of the cypress in pregnant and nursing women or in children is not advisable.